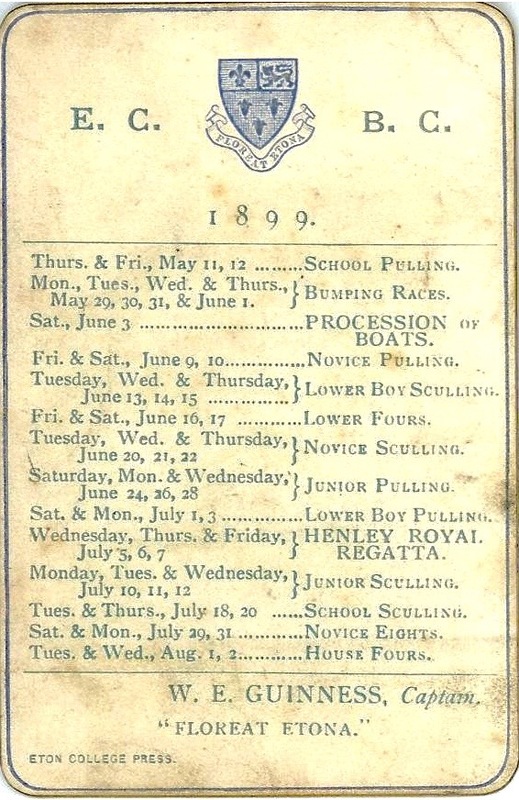 Eton’s rowing programme for 1899. While writing on his recent visit to view the famous school’s ‘Procession of Boats’, Tim Koch found some other rowing and non-rowing images of Eton worth sharing. 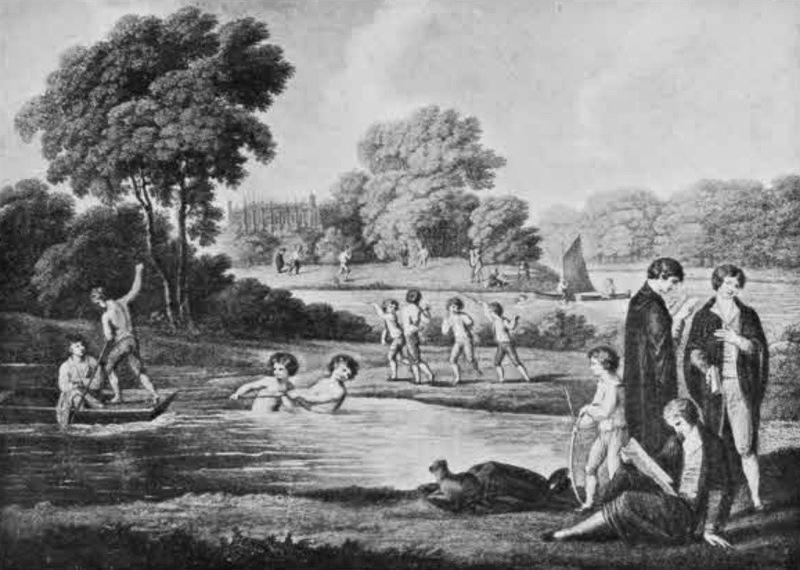 Eighteenth-century engraving of Eton boys swimming and playing. 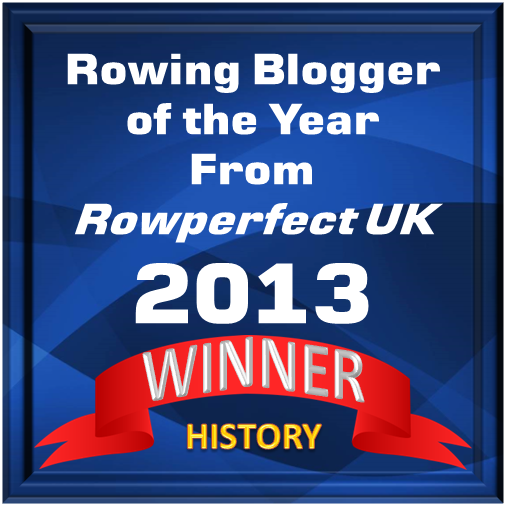 However, rowing historian Bill O’Chee informs me that the ‘sprightly races’ actually refer to swimming contests. He holds that ‘boating came late to Eton, having been preceded as a pastime by swimming’. 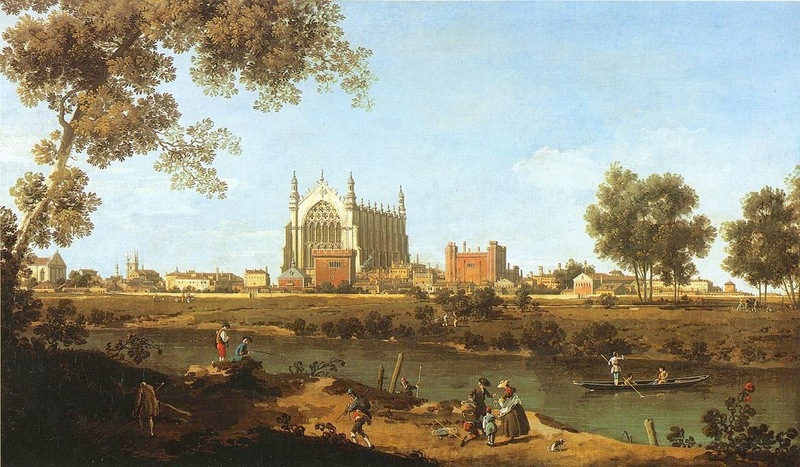 ‘The Chapel of Eton College’ by Canaletto. The school is here shown from the east; it is viewed from across the river Thames. The general position of the chapel appears as it would be seen from this direction, but many of the other details of the buildings are invented. The view of Eton College Chapel today. 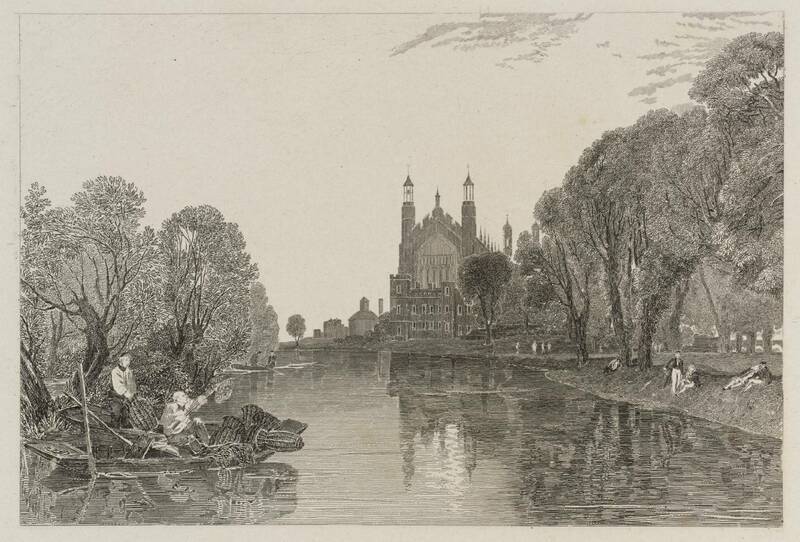 Eton College, Berkshire by JMW Turner. 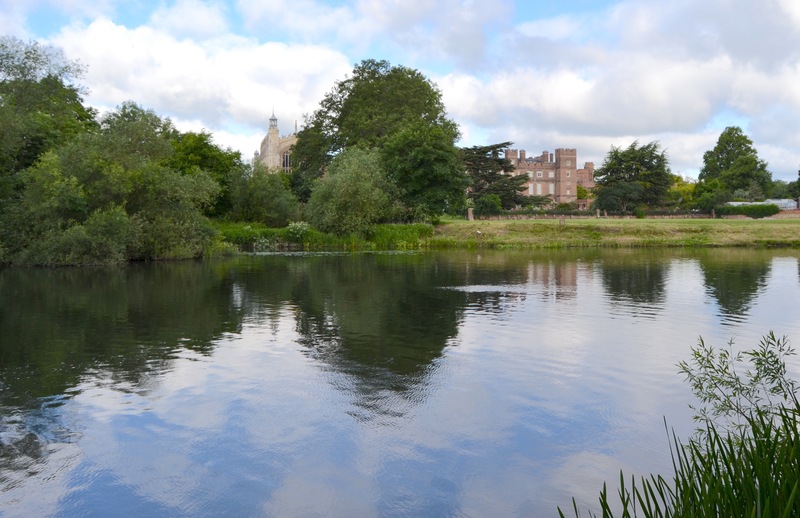 Mr. TURNER, the Royal Academician, has executed a series of views in different parts of England and Wales… The view of Eton College is one of the happiest efforts of the whole. Other artists have frequently taken the same building at the same point of view, but they have forgotten to add that fine sentiment which is rarely absent in TURNER’S productions, and which in this instance is more than usually conspicuous. Jack Hall – The Eton Fisherman. ‘Foxy’ Hall was a well-known character who served the school for nearly 50 years. 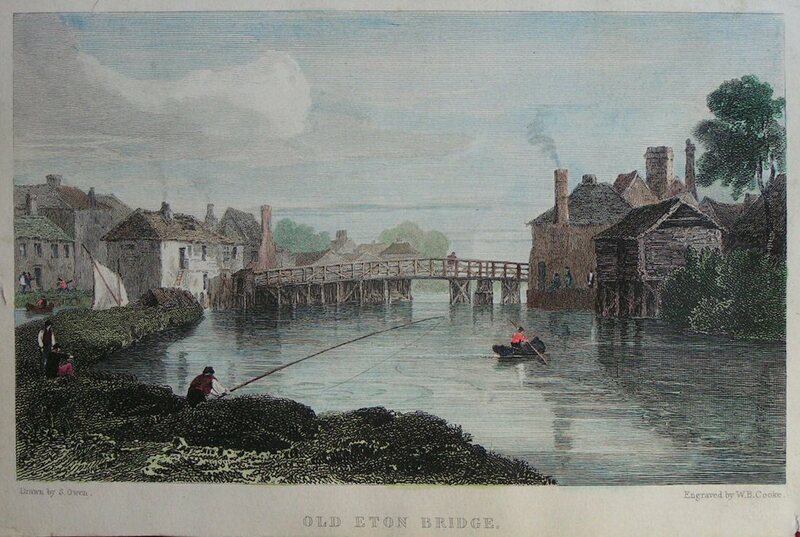 He was ‘the most worthy of the Eton Cads’, a ‘Cad’ being a waterman employed as a stroke or steers. 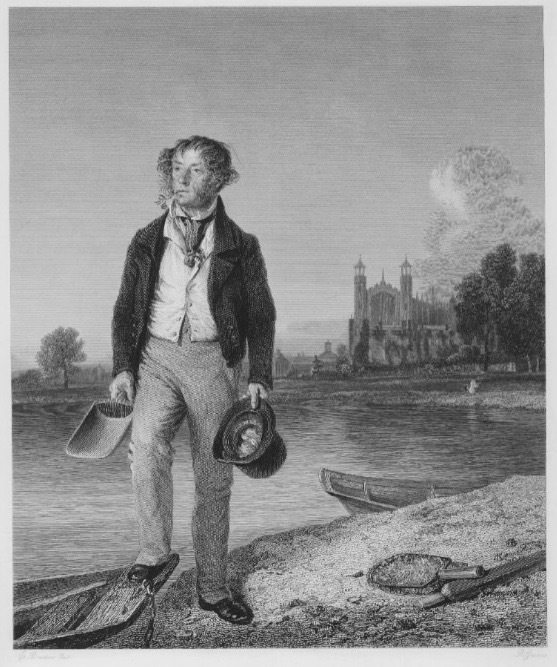 Hall drowned in 1834 and this popular engraving was possibly produced as a memorial. 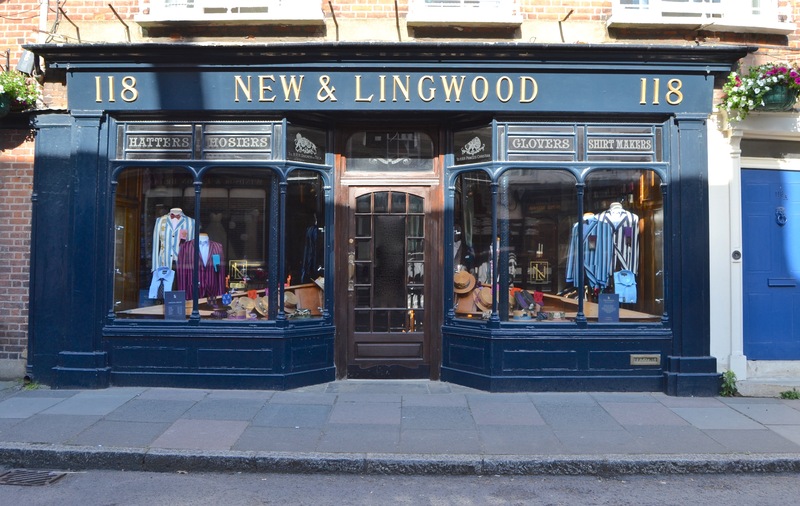 New & Lingwood, based at 118 Eton High Street, have been outfitters to Eton College since 1865. As well as supplying the school uniforms, they also sell kit relating to the unique system of sporting, society and House colours that has evolved over 150 years. The school uniform is basically ‘morning dress’. 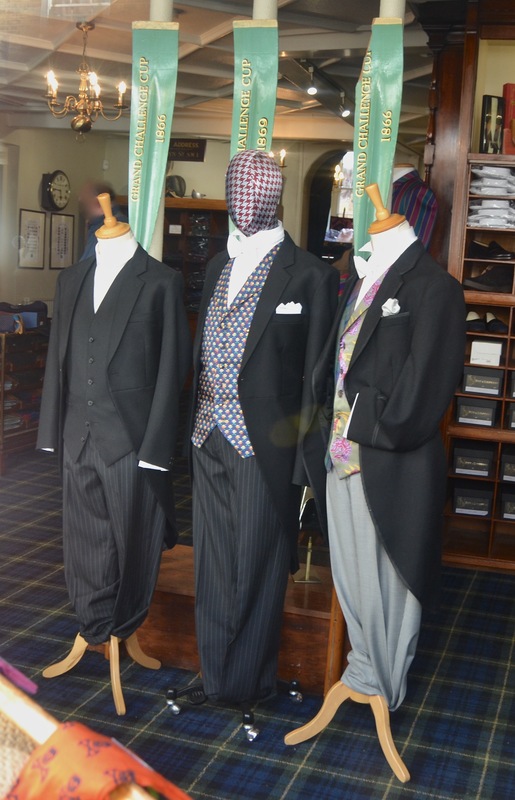 On the left is the standard uniform (‘School Dress’) and on the right is the uniform for the Eton Society or ‘Pop’, prefects who can wear silk waistcoats of their own design. 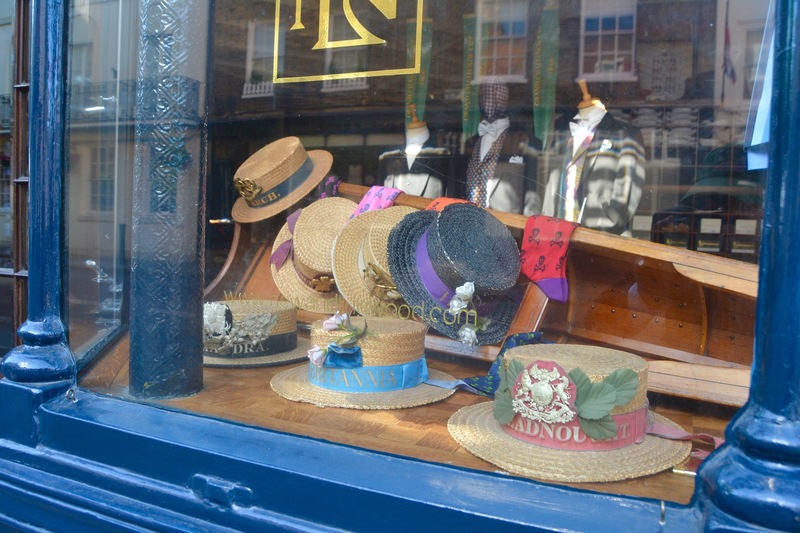 New & Lingwood’s window, displaying boaters used by different crews in the Procession of Boats. More ‘Procession’ boaters. The blue and white stripe blazer may be of the Shooting Eight (guns, not boats) – though, incongruously, it is decorated with Procession boater badges. 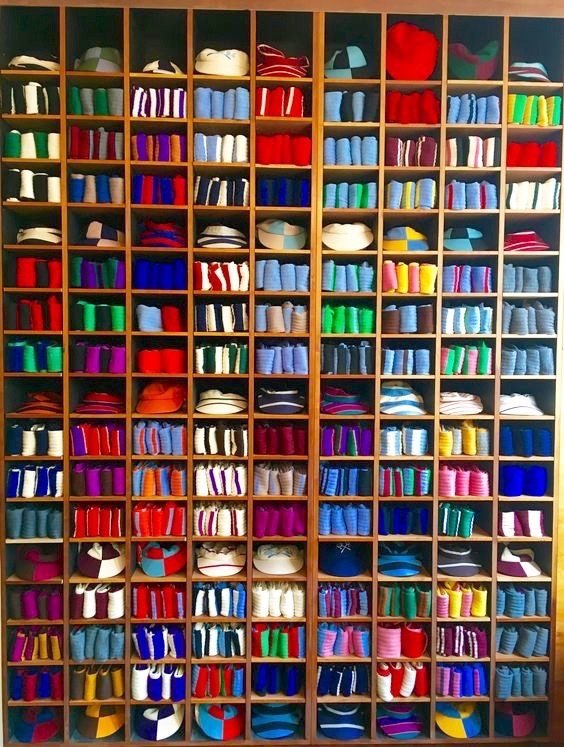 Cap and socks in various sport, society and House colours. Picture: New & Lingwood. Eton’s unique colours system really began in 1860 with the creation of the Field colours of scarlet and Eton blue. Although Eton blue had been used for many years before this for both the (rowing) VIII and the (cricket) XI, it was only in 1860 that colours were formalised and then used in a myriad of colours by houses and other school sports. 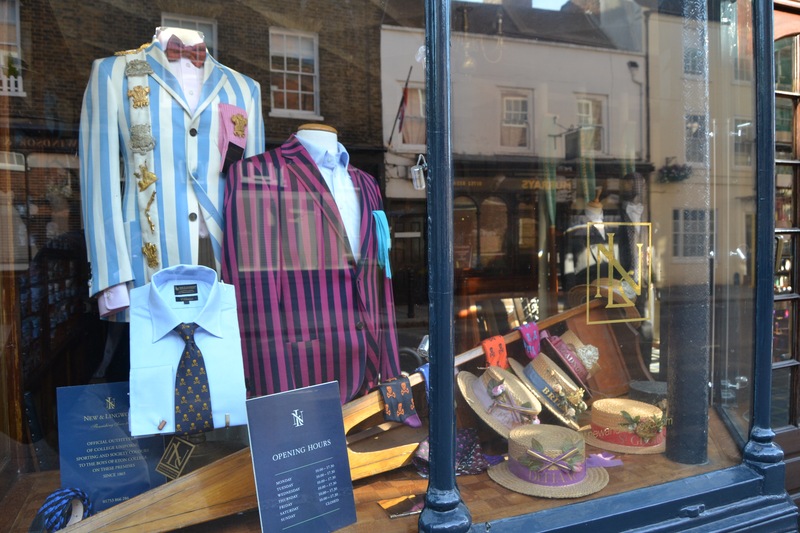 These colours stand at the heart of Eton sports ranging from sartorial elegance to garish hues made up on the whim of the Captain of the Boats to Housemasters’ wives. A glimpse of other items from Eton’s large ‘dressing up box’ is on a local photographer’s website. 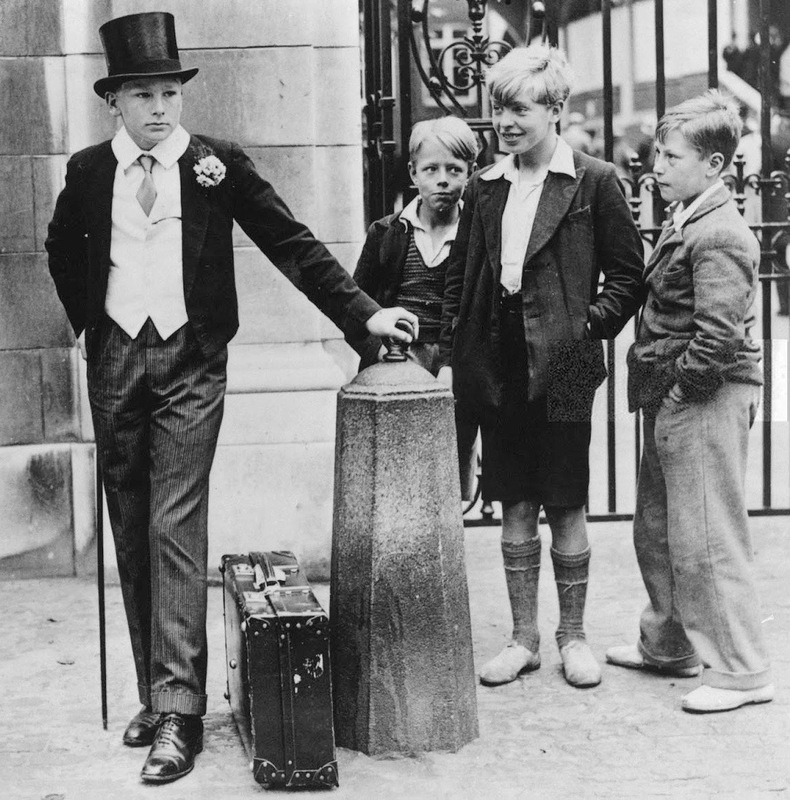 It is often incorrectly stated that this famous picture shows two boys from Eton, a mistake often made even by such august bodies as the anarchist group, ‘Class War’, an organisation that probably contains enough Old Etonians to know better. ‘Iconic’ is an overused adjective but this picture of five British schoolboys, taken in the summer of 1937, most defiantly qualifies. Its connection with Eton is indirect – but relevant. Soon after it was first published, the two boys on the left were incorrectly identified as Etonians, and this mistake has often been repeated. In fact, the two ‘posh boys’ were from Harrow School (they had just left the annual Eton – Harrow Cricket Match at Lord’s Cricket Ground). Perhaps the repetition of the error has, in some cases, been willful. 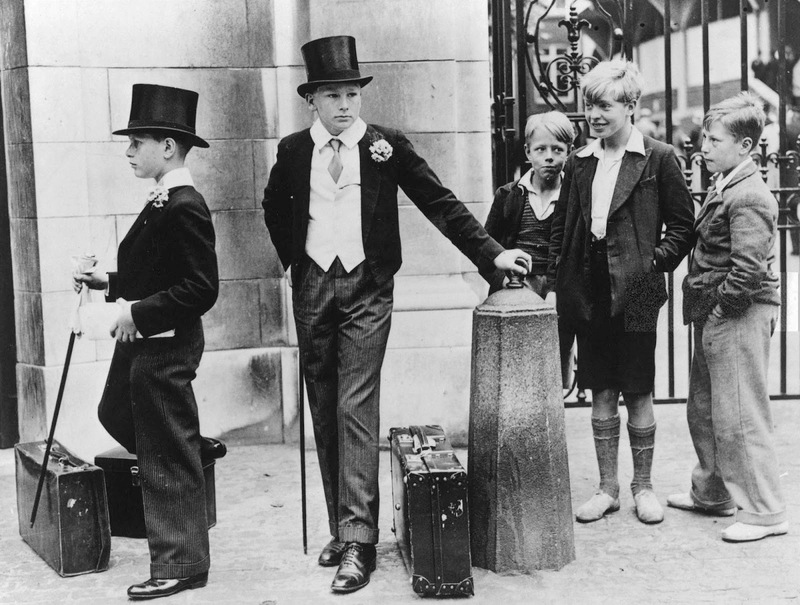 Ever since its publication, the photograph has been frequently reproduced as ‘the defining image of class division’, and, of all the alleged villains who apparently perpetuate this inequality, Eton ranks very high, even above the other British public (i.e private) schools. However, like many ‘iconic photographs’ where real people are used as symbols, the facts reveal a twist. The photographer, Jimmy Sime, manipulated the scene somewhat when he got the three working-class boys to move closer to the Harrow boys (who appear to be trying to ignore the whole thing, the impression is that they were not asked for their consent to be photographed). Many versions of the picture crop out the smaller boy on the left, lending a greater (though false) arrogance to the remaining boy, Thomas Dyson. Another version,with Dyson looking left, does not work as well. 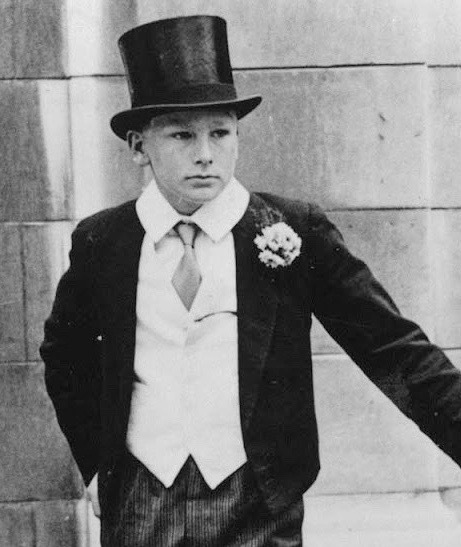 The point of the photo is that the wealthy ‘toffs’ would grow up to have a comfortable life, full of pleasure and privilege, but the working-class boys would enjoy no such advantages and faced a future of hard work, discrimination and perhaps suffering. In fact, in this particular case, that is not how things worked out. Thomas ‘Tim’ Dyson, the Harrow boy looking toward the camera, died of diphtheria a year after the picture was taken, and his father perished in a Japanese prisoner of war camp in 1942. The other Harrovian, looking to the left, was excused war service on health grounds but later followed a conventional path and entered his family’s stockbroking firm. However, when he reached his 40s, he began to suffer from mental illness and he eventually died, aged just 60, in a psychiatric hospital. Thomas ‘Tim’ Dyson was dead 13 months after this picture was taken. In striking contrast to (the two boys from Harrow School), all three men had reached old age and a plateau of contentment… (But) when a newspaper… had asked the three men to get together to reconstruct the picture at Lord’s, or at least their part in it, (one) had refused. Probably to be stereotyped as a poor London boy – a tough even – may have irritated a man who had made good and probably felt no nostalgia for the pre-war streets of his childhood. Thus, ultimately (though perhaps not typically) the ‘underprivileged’ boys had a better life, something that seems to undermine the message of the photo. Possibly, the truth is not actually relevant and that the symbolism is in fact the really important thing. Perhaps the only definite that we can get from learning the facts behind the picture is that real life is very rarely as simple as sometimes we (and Class War in particular) would like it to be. Introducing Jimmy Sime’s photo into an article ‘in words and pictures ‘about Eton Tim Koch poses an interesting philosophical question namely Truth over Symbolism ,their relevance and importance to life ,rowing and ,particularly in Britain, the class system in the 21C. 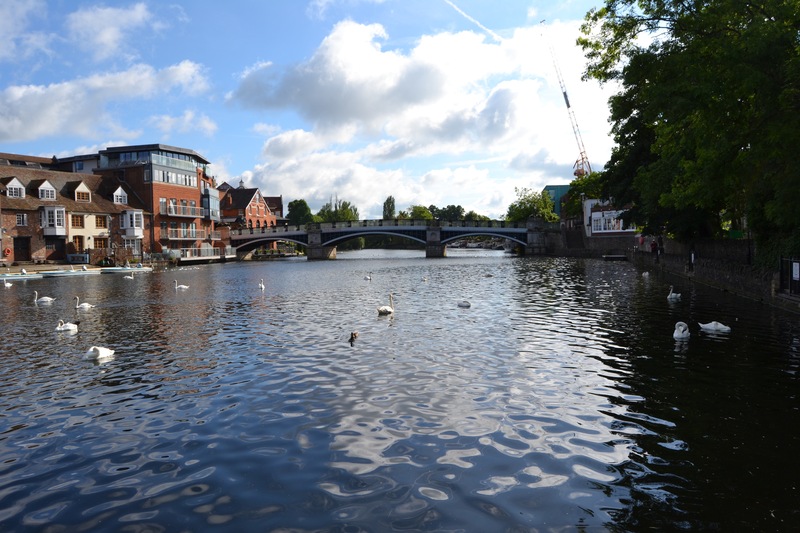 As a ‘Sarf London Boy, born and bred’ introduced to rowing in 1960, aged 13, at my state comprehensive school rowing out of the L.C.C.’s Barn Elm Boathouse on the River Thames just up river from Beverley Brook and opposite Fulham Football Club’s Craven Cottage ground. I have always bridled at the description of Rowing as a posh sport. Symbolically for many it is , certainly the man who swam into the path of the University Boat Race a few years ago protesting against Elitism, thought so. But the Truth, as any one involved in the sport knows, is that there are as many ‘ordinary’ men and women, not unlike the descendants of the three other lads in that iconic photograph, participating in the sport today. Granted the pomp and circumstance of HRR and the recent Doggett’s race exemplify Symbolism ,however, the fitness , dedication , sheer hard work and enjoyment of the participants in our sport transcends class and reiterates the Truth. Here endeth the lesson !